Click on the image above for a PDF of the Westerbeke Declaration. The International School Grounds Alliance (ISGA) was founded in September 2011 at a leadership retreat in California, USA, following the first international green schoolyard conference held in the United States. At this founding gathering, ISGA’s future Leadership Council members collaborated to write a statement that expresses our organization’s vision for the global school grounds movement. This document is also intended to guide ISGA’s work into the future. The Westerbeke Declaration on School Grounds was signed by the thirty-four (future) Leadership Council members who participated in the meeting. These signatories (shown above) hailed from twenty-nine organizations in seven countries. The Westerbeke Declaration was read to the retreat participants at Westerbeke Ranch in Sonoma County, California, USA in September 2011, and then made its public debut with a live reading at the opening of the Nature School conference in Toronto, Ontario, Canada in September 2013. 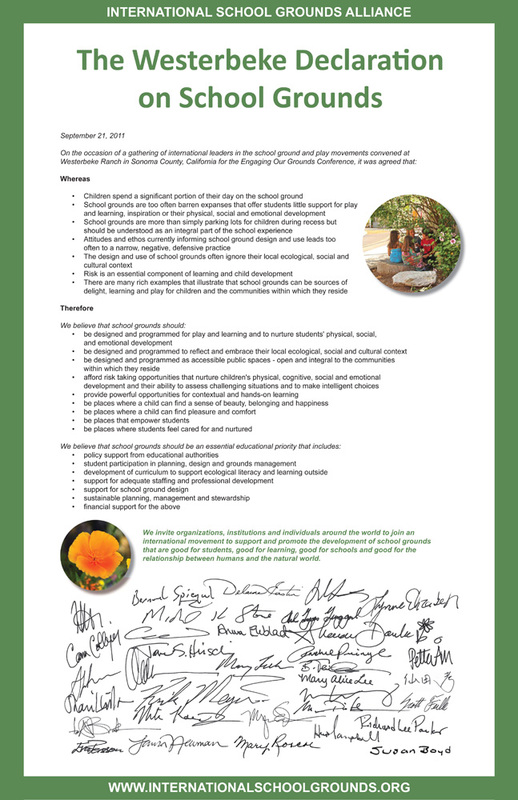 In June 2014, the government of the State of California in the USA adopted a version of ISGA’s Westerbeke Declaration on School Grounds as an official State Resolution! As a result, the California government now declares the month of May to be Living Schoolyard Month every year (based on ISGA's annual celebration of International School Grounds Month), and asks all 10,000+ public schools in the state of California “to prioritize the design and construction of student-accessible green space on school campuses and to integrate use of this space into the teaching of standards-based curriculum.” The full text of California’s resolution (called “ACR-128”) is available via this link: http://bit.ly/CaACR128 and is posted below. The resolution was written by California Assemblymember Phil Ting with support from several of ISGA's California-based Leadership Council members. This was the first time that ISGA’s work directly influenced a government document. Click here to read an article with more information about California's Living Schoolyard Month Resolution. We hope that The Westerbeke Declaration, and other work by the ISGA, will be adopted by additional governments around the world in the future!